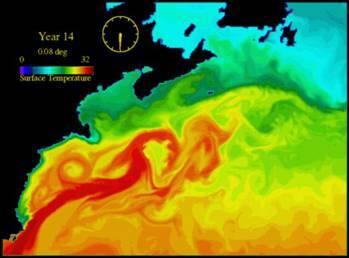 While the global warming scare got rolling, other climatic events have also garnered much alarmist attention. Animals are the focus of this document. 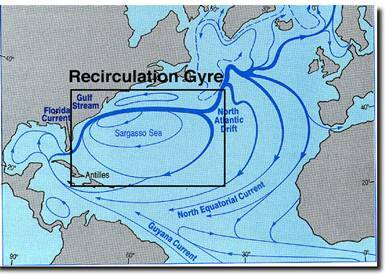 Some global warming alarmists suggest that the North Atlantic Thermohaline Circulation (NATC) or (Atlantic Meridional Overturning Circulation) will be disrupted by the melting of the Arctic ice cap, causing an ice age. 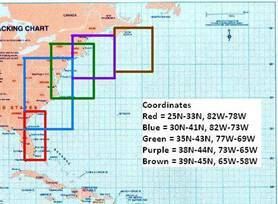 Although this is known by scientists to be a bogus scenario – it has often been used as a scare story in the popular media. 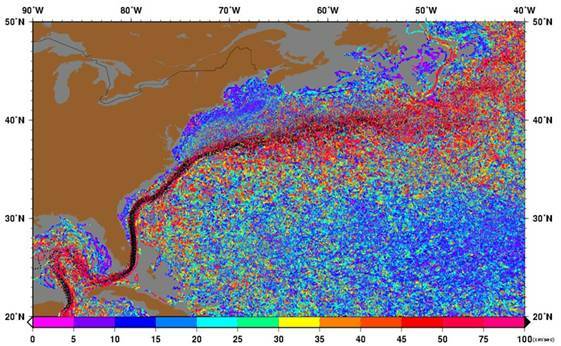 This has mainly come about due to a general misunderstanding of the NATC and the Gulf Stream. 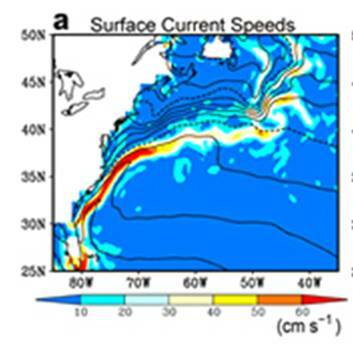 The simplistic view is illustrated in the following figure, which shows the Gulf Stream as a laminar flow and recirculating as a deeper stream as part of the NATC. 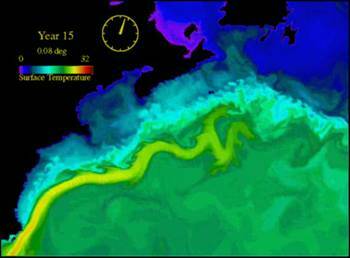 The actual Gulf Stream and its relation to the NATC are more complex – the Gulf Stream is examined in the next section. 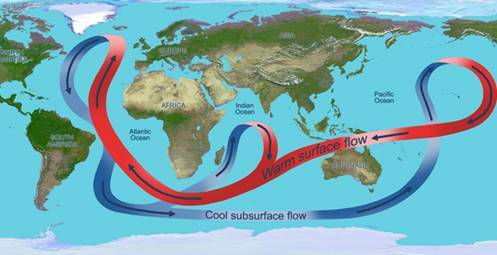 Another part of the misunderstanding is the myth that the Gulf Stream heats Europe. 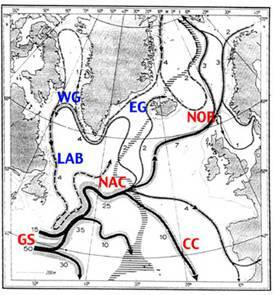 A 2006 article by Richard Seager (senior research scientist at Columbia University's Lamont-Doherty Earth Observatory) in American Scientist (“The Source of Europe's Mild Climate” subtitle “The notion that the Gulf Stream is responsible for keeping Europe anomalously warm turns out to be a myth”) [http://www.americanscientist.org/issues/pub/2006/4/the-source-of-europes-mild-climate/1] provides a good explanation of how the oceans warm the land on the eastern side of the ocean. 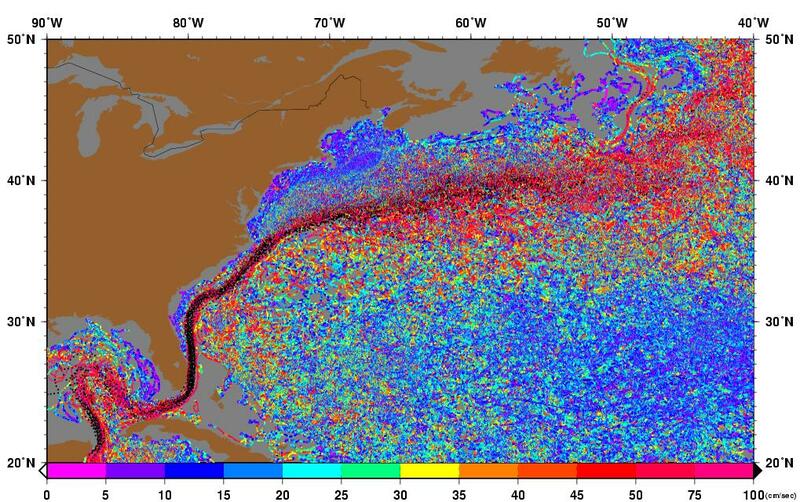 The following graphs show sea surface temperature (SST) anomaly graphs for five Gulf Stream areas as shown on the map below [http://bobtisdale.blogspot.com/2009/03/gulf-stream-sea-surface-temperature-sst.html]. 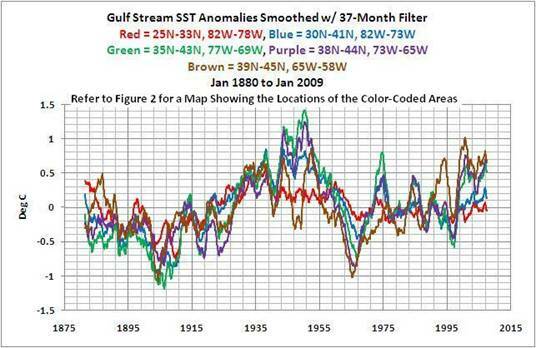 Recent SST warming is well below the warming of the 1930’s-1940’s.